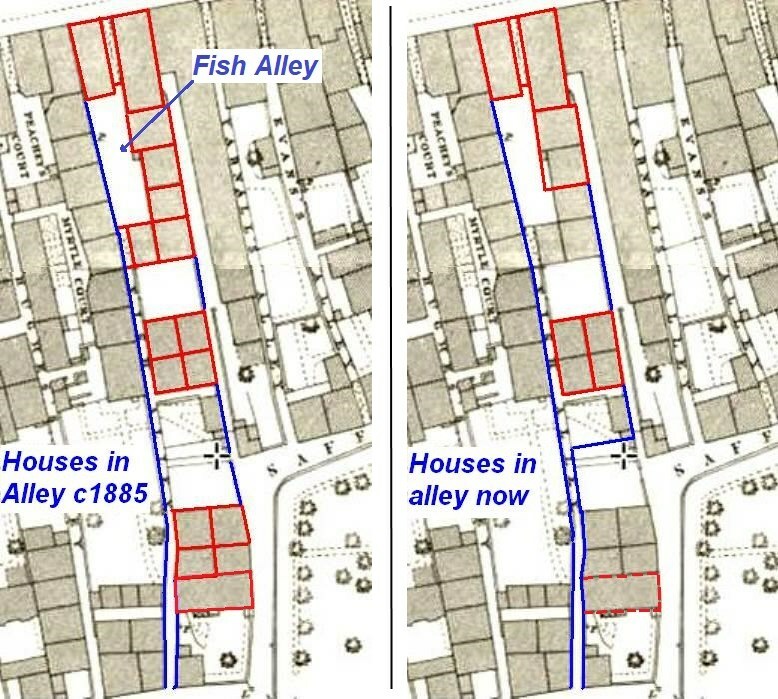 Fish Alley runs from Barton Street to Swilgate Road, or ‘Back of Swilgate’ as it was known before street signs. It is one of a series of alleys which used to run between these two streets, several of which remain, though the warren of courts and yards within the alleys have now gone. Early names were Jeynes’ Alley and Bell’s Alley. 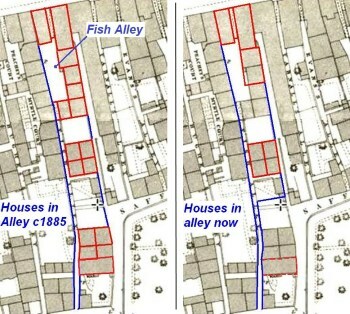 In 1848, though, when the Council had name plates made for all the alleys it was called Fish Alley and so it remains. The name seems to have come from the connection with fish, there being fishermen and fishmongers living there in some numbers. The history of the people who lived there suggests that ‘Soldier’s Alley’ would have been just as appropriate a name. Writing in 1905, John Rogers remembered Joseph Witts (who had died in the previous year, aged 81), whose grandfather, Joe, fought at the Battle of Bunker Hill, defending Boston in the American war of Independence. One of the battles the British won! In 1899, Private Rice was writing to his sister, Mrs Hughes, telling her about his exploits at Ladysmith, in South Africa. He was concerned that she would see his name in the reports as killed in action, and wanted to reassure her that this was his namesake, also in the Gloucestershire Regiment. Though the fighting was desperate, he was safe. Also living in Fish Alley was Mrs Sarah Bennett who had four sons who went to war against the Boers. Three were with the “Old Braggs” (the North Gloucestershire Regiment) and the fourth, Thomas, was with the Scots Guards. Charles was wounded at Reitfontein and hospitalised in Ceylon. Queen Victoria sent £2 to Mrs Bennett as a mark of Royal appreciation. Like many heroes returning home, not everything went smoothly for the Bennetts, unfortunately. Thomas had been badly affected, to the extent that he was twice, in 1908 and 1914, brought before the magistrates for the crime of attempted suicide. Though he was treated sympathetically, he still spent time in custody awaiting trial. The magistrates saw his drinking as the problem, and restricted access to his pension to control it. In the First World War, Sapper Sam Heath, RE, was wounded in 1918; Private John Greening of the West Yorkshire Regiment was killed in action in the same year. By 1939, most of the cottages in Fish Alley had gone, and there were no sons to go to war. Fish Alley doesn’t follow the regular layout. The entrance off Barton Street was lead on to a labyrinth of small courts cheek-by-jowl with cottages; nineteen of them altogether. This made it one of the most heavily populated alleys in the town. An unusual feature is the dogleg in the alley, which is a result of its unusual layout. 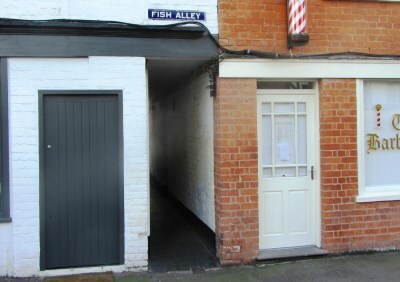 Fish Alley lies behind two front houses. Behind No. 69a, the front building, is an open area and the alley changes sides, to the plot behind No 70 down to Swilgate Road. Once, these two sections were called Fish Alley East and West. This created room for courts and ‘back to back’ high-density housing. The condition of the alley led to early clearance. An order was confirmed to demolish twelve cottages in 1937, despite the impassioned objection of Alderman George Howell, who happened to own several of them. His objection was that several were occupied by old people who would have difficulty settling in to new houses. In 1939, the demolition was carried out. Alderman Howell had a miraculous escape when a roof unexpectedly collapsed on him whilst he was watching the work. He suffered nothing worse than bruising. The demolition of Peachey’s and Myrtle courts to the west, with nothing being built to replace the lost buildings, changed the landscape of the alley. A few houses remain, and among these is a block of what was once four cottages built into courts, now converted into two houses. There are plenty of remnants of what was once a teeming alley, but it takes a lot of imagination to picture the alley as it once was.